With a background in web analytics and front end development, as well as building out custom Drupal and Wordpress backends with an eye towards usability, Ben plays an important role on Mediacurrent’s front end team. In his early career, Ben sold digital advertising for newspaper companies (Chicago Tribune and Gannett). Driven to learn something new everyday, have a flexible work environment, and work in an in-demand field, he began taking programming lessons on the side of his advertising job. He built a freelance portfolio and soon landed an apprenticeship at a local marketing agency. 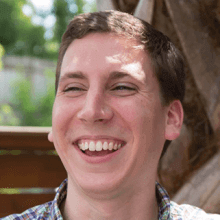 In this role, Ben cut his teeth on some smaller support tasks and was eventually asked to join the team as a full-time member, where he was able to create front-end development best practices for the team and lead Drupal development projects. Ben lives in Greenville, South Carolina with his wife, Ruth. He loves to garden, compost, read, ride his bicycle and hike.